It's no secret I'm part clown. I love make up and have enough to supply an entire beauty pagent or Ringling Brothers. With that being said, I get asked here and there what I use. 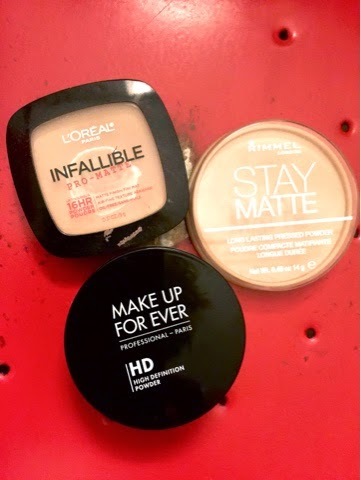 I thought I'd do a small series on my make up preferences, starting with foundation, concealers,and powders. I'm keeping simple (for me anyway). I don't use everything in the picture all at once, I switch according to what I have planned for the day, time of year and how my skin is feeling. 2. It Cosmetics Your Skin But Better CC+ illumination color correcting illuminating full coverage cream + anti-aging hydrating serum (that's a mouth full). It has an SPF 50, the illumination is some what new, and I like it a lot. I generally purchase It cosmetics at Ulta or online. 3. Hard Candy Glamoflauge, invisible camouflage foundation (it's really new). I've used it four times and I'm kind of loving it! Hard Candy is only available at WalMart, this foundation was seven dollars! 2. 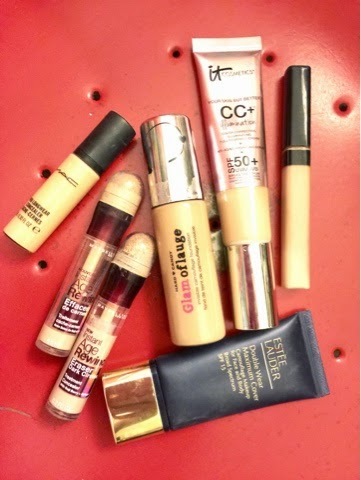 Maybelline Instant Age Rewind (seriously can not leave home without it). I use light and light and medium (depends on if I've self tanned or not). It's under ten bucks and worth the try. 3. MAC pro longwear concealer - it's like the Queen of Concealers. I think it's about $25 which is pricy and the bottle is small 0.30 oz, but it's nice! I feel like it doesn't (as well as the others I mentioned) crease or sit into my fine lines (a.k.a. Winkles). I do set with the Makeup Forever HD powder. These are the powders in my current rotation and I like them but do not feel like I've found THE POWDER of my dreams. I'm open to suggestions. 1. Makeup Forever Professional HD high definition powder: it's finely milled, smooth and colorless. It doesn't look cakey and I like the over all results. I'm about out and will repurchase (on my second one already). It's under thirty dollars I believe and you can get at Sephora. 2. Rimmel London Stay Matte: inexpensive, drugstore and it works! It's easy peasy, and for four buck you can't mess up. I have repurchased several times and will continue. 3. L'Oreal Paris Infallible Pro-Matte 16 hour powder: it's not on the cheaper end of drugstore but it's afforable, I like but not love. It's ok, I can't really complain but it doesn't excite me. The packaging is weird (you have to flip all around to get it the mirror). It comes with a sponge applicator, not a fan of. It's ok. I need a better drugstore compact powder option, probably going to stick to my OLD school cover girl compact for the purse. That's the long and short of it, not exciting and I have not ever been the girl to use the same makeup products for years and years. I like options and different coverage and feels during different times of the year. Next makeup post I'll share primers products I use. If you have a loose powder or compact you can't live with out please share!!!! Thanks so much Tikaa! You always look so polished. Right now i'm hooked on smooth operator Amazonian clay tinted pressed finishing powder by TARTE!!! I love it and can't live w/o it! My favorite primer is by Smashbox.. I use the green one for color correcting.. it's perfect for me or anyone who has a little or a lot of redness in their skin. I love a good primer......after a certain age they are a must. Have you tried Lorac? I have tried many and love this one because it's for sensitive skin. It's the 'I'm so sensitive' version at Nordstrom.